This game is great for kids and adults alike. It is the perfect game to play if it is just you and your spouse, or a large group of people. 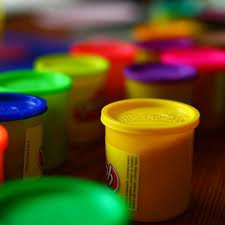 Whoever happens to be around, grab some play-dough, sit down and have fun. Lots of colors is fun, but one color will work just fine also. If you don't have the store bought, no biggie, homemade play-dough will work great too. I have included a list of words for you at the end of the post to get you started. Add any other words you think would be fun, or that would work for your family. Give each team play-dough. We like to give each team a few different colors. Print off one copy of the words (listed below) for each team. Cut the words into strips and put them in a bowl or baggie. When you say "GO", one person from each team will choose a word out of the bowl. They will attempt to "SCULPT" that word for their team using the play-dough. They cannot talk, make noises, use actions, or anything else. They can only use the play-dough. The rest of their team is trying to guess what they are making. Once someone on their team has guessed, the next team member pulls another word out of the bowl and begins to sculpt. This continues, everyone taking turns sculpting, until all the words in their bowl have been guessed. The team to do this first, wins. Instead of going through the whole bowl of words to win, you can set a timer. When time is up, the team with the most words guessed, wins. Small teams, such as teams of two will work just fine. If your children are small and can't read yet, instead of words, draw pictures and put those on the different slips of paper. Or even create a separate bowl that holds the picture clues. When it is an adults turn, they pick from the words. A child's turn, they pick from the picture clues. If you have a really big group. Put one person in charge of the list of words. Send one "sculpter" up from each team to get their first word. They have to run back and sculpt. As soon as their teammates correctly guess the words, a new person from their group runs up to the person with the list and they given their next word. This lets teams run and move around and adds even more fun to the game. The team who successfully gets through the whole list first, wins. I hope you and your family have a wonderful weekend. Love this (...and that you gave us a whole bunch of words to start with) :) Thank you! What a perfect activity :) I'm sure even my 2.5 year old would love to try it. Thanks Danielle, our daughter just turned 3 and she loves this game. I know it will be a hit in your house too. Free word list with many phrases to play charades, pictionary, catchphrase or other guessing games. Quick way to generate pictionary words and charades ideas online. This game is the best idea to spend funny time with friends and family, kids and adults!